The HySense® PR 100 with its high-grade steel membrane, is an extensively proven pressure sensor for mobile applications. 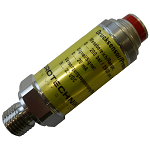 It is available with Hydrotechnik ISDS, the automatic sensor detection system. It is available in several pressure ranges from -1 to 600 bar.